The Rogue is just like vog. It is grey and it pollutes my vision. ‘Pick any car in that line’, the attendant said pointing to a row of vehicles. I looked to see one 2018 Jeep Renegade Trailhawk, two 2017 Nissan Frontier Pro-4X’eses, and one 2017 Nissan Rogue SL AWD. I have a wife, two children, and enough baggage to scare any bell hops away at the gate. Guess which vehicle we rented? Not my first choice, I wanted the Frontier, but family comes first. The Rogue represents everything that is bad in the current automotive world to me. Another CUV to maximize profits. Great. Let’s all keep up with the Jones’. Like we need more CUVs?! Ford isn’t even selling sedans anymore because they don’t make money. No one is buying sedans. Everyone wants a CUV. These things are the car-mageddon on the horizon. We have seen the first wave of the blast, but the radioactive fire hasn’t hit us yet. But it is coming! Instead of burning up, leaving only a ghostly print on a wall, we will be driven around autonomously in a bland, vanilla CUV. I hate CUVs so much... I went out and bought a mini-van. Stop trying to admit you hate them. You think you hate mini-vans because they were the CUVs of our childhood. Everyone had one, so therefore they were uncool. No one ever said a mini-van would be cool, but you wait. Everything that is old is new again. The same can be said for the CUV but in reverse. 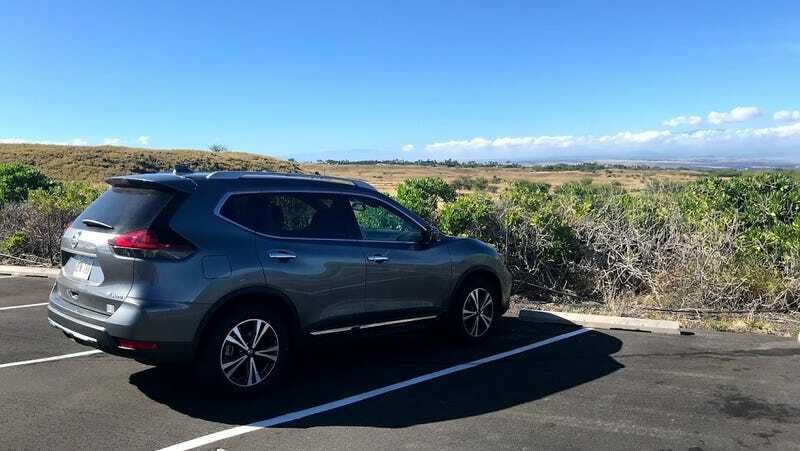 I’ve always been a Nissan fanboy, so naturally, I am that much more hurt than I should be after experiencing the Rogue. I’ve owned a couple Z32 300zx’eses, 240sx, Titan 4x4, and currently a Datsun sedan with some leather known as a G35 6mt. I’d like to think I know a thing or two about the ol’ hamburger logo company. See that in the distance? Vog. Inside the vog is Kona-Kailua. Picture taken north from Spencer Beach. When we planned our vacation six months ago. This was not happening. Although, I wasn’t a bit apprehensive. I enjoy researching and found that other than maybe a couple days of vog, everything would be fine. And it was exactly that. There was just enough bad media on the vog to scare away the blue hairs and worry-warts. I like less crowded places. Win for the team. Unhealthy particulate matter in the air. Ocean View is farther south and therefore worse almost always. Vog. It didn’t smell, even though it can. It resembles being close to a forest fire. The vog contains all the nasty parts of the volcano, anything it consumes, and the chemical products of reaching the ocean to create more terra firma. The sulfur dioxide wasn’t any worry but the Particulate Matter (PM) was something to worry about. At the worst it was ‘unhealthy’ which isn’t really that bad as it is really only an issue for ‘sensitive groups’ (kids, old people, medical issues, etc.). The blue sky / vog transition barrier. Our condo was on the west side of the island of Hawaii, in Kona-Kailua. The drive from the airport takes around 25 minutes, just enough time to feel out the Rogue. And it feels Rogue-ish? Considering what Rogue defined means... (check out the synonyms) I’m not sure the marketing people made a good decision. Maybe a bad translation? Quite frankly, it feels similar to any CUV I’ve ever driven. I’m not sure how C&D or Road and Track write so much about this stuff. Debating over the difference between these things seems underwhelming. In a time when everything is similar quality and nearly everything is regulated or standardized, this is another lifted, tall roofed, hatch back, pretending not to be a wagon. This thing is designed for one thing: to move you and yours as efficiently as possible whilst pretending to provide your boring life with some sport or style. I did find some things interesting or at minimum noticeable. The steering wheel has a flat bottom to it. Reminiscent of a sports car or maybe to provide the driver a memory of the Sparco they installed on their Civic when they were a teenager. There are buttons. Lots of them. Why? It provides a sense that there are amenities and features. The more buttons, the more options you think you’ve received. The sport button? Not sport enough. The ECO button. Probably too much. AWD Lock would have been fun to test out. Steering wheel heater? In Hawaii?! I did find the backup camera amusing. With several cameras they are able to provide you with a top down view when backing. I tried to back without looking out the windows or using my mirrors. It feels like a really dangerous video game where a game over means calling my insurance company. The most annoying part of the Rogue Ne’er-Do-Well? First, you must press the lock button on the FOB. This produces a honk and the hazard lights flash. Second, press the auto start button on the FOB for at least two seconds. The Rogue Scoundrel will start. Then, press the unlock button to get into the car. No proximity sensor on this FOB. Finally, once inside press the brake pedal and press the start button on the dash. You’d think with the key in your pocket you wouldn’t have to ‘start’ a running car? Neither did I. I pressed the brake pedal, pulled on the shifter, and the engine stalled. So much for ‘auto-start’ I had to do it the old fashion way anyways... this is either an anti-theft feature or some novelty to remind you the more button pushing the more bells and whistles you’ve got. Yay, resale value? Is this what our collective complaining for fun cars has given us? After a week of driving the 2017 Nissan Rogue Good-for-Nothing SL AWD, I was reminded of one thing: they don’t sell cool. We do. No amount of marketing can make this thing cool. You and I could make it cool. Maybe more power, a better suspension, a louder exhaust. Yes. Everything is made better by modification. Always. Waipio Valley. You can drive down here on a ‘4wd Only’ road that looks like a paved goat trail. Then again. The mileage could damage the pocketbook, the suspension would punch my kidneys, and the exhaust would keep the baby awake. Never-mind, I’ll just say that I’m happy we bought a mini-van. It does all the Rogue Miscreant can and more. Wait... Happy I bought a mini-van?! Kill me now.